What Pests Leave a Fine Web Other Than Spiders? 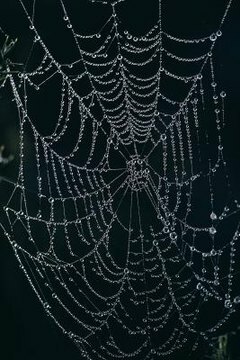 Spiders are well-known for their amazing web-spinning abilities, but they aren't the only pests who produce silk for webs. Spider mites and several types of caterpillars also make webs, ranging in size from so tiny you can barely see them to several feet in length. Unlike most spider webs, these webs can be damaging to your plants and trees. Spider mites are tiny insects that can cause big problems in your garden. They attack a variety of plants including flowers, vegetables and fruit trees. Spider mites typically hide on the bottom sides of leaves, making them hard to spot until there's a true infestation. They have spinnerets similar to those of a spider, and they build webs across the front of leaves to house their eggs and young. It's hard to see these webs until they start collecting dirt or other debris. Spider mites can also use their spinnerets to make "balloons" of webbing that can carry them from one plant to another. Tent caterpillars spin large web houses in the crotches between branches on trees or plants with large stems. The tents protect young caterpillars, or larvae, from predators as they grow. The larvae eat the leaves inside the tent, then venture out for food before crawling back into the web tent for protection. Some species, such as the forest tent caterpillar, make sheets of webbing instead of actual tents to give their young a place to gather and rest. Webworms make large web structures on trees to protect themselves as larvae. The caterpillars stay in the webs as they grow, making them longer as necessary to enclose more food. Unlike tent caterpillars that leave the tent for food, webworms stay inside their web homes and enlarge them so more food is under the web's protection. When the webworms die, their webs remain in the trees. This can be unsightly, but it's not usually damaging to the tree unless there are so many webs that the tree no longer has enough foliage to get nutrients from the sun. Although they're unlikely to be mistaken for a spider web, many caterpillar species have spinnerets that produce silk to make cocoons or webbed hammocks to support a chrysalis. A caterpillar sleeps inside his cocoon or chrysalis -- which is formed when a caterpillar sheds his skin for the last time -- as he transforms from a caterpillar to a moth or butterfly. Coffs Harbour Butterfly House: What is the Difference Between a Cocoon and a Chrysalis? Why Do Caterpillars Hang From Threads?